By 2030, 'no Australian child will be living in poverty' - why can't we promise that? Following revelations that more than 300,000 children are living in poverty, the New Zealand government has announced the creation of a ministry for vulnerable children. This should cause Australian leaders to pause and think – how many vulnerable children live in poverty here? And should we be doing something about it? Even though Hawke later regretted it, the prime minister’s 1987 statement was powerful and valuable. It sparked debate and told Australians, and the world, that child poverty was not acceptable and that we were going to try to fix it. It pinned a flag to the flagpole. Despite the controversy Hawke’s comments caused, in 2016 Australia has no flag and no flagpole. The issue of child poverty is not widely acknowledged. So is New Zealand showing us the way? Bob Hawke makes his child poverty promise at Labor’s 1987 election campaign launch. How bad is the problem in Australia? Recent analysis based on the Household, Income and Labour Dynamics in Australia panel data suggests that about one in ten children aged under 18 years live in income-related poverty. The situation is markedly worse for children living in single-parent families: around one in four live below the poverty line. In absolute numbers, the National Centre For Social And Economic Modelling (NATSEM) found 618,000 people aged under 25 years and 494,000 aged under 15 were living in poverty in 2010-11. This is a problem twice the size of the one New Zealand’s new ministry faces. Income poverty statistics tell us relatively little about why Australian children live in poverty, or how to alleviate it. Recent evidence suggests that, as part of any detailed investigation into childhood poverty and its drivers, we ought to be looking closer to home: at housing and the increasing insecurity of housing for many low-income households. NATSEM identified location and housing costs as important causes of the childhood poverty problem. 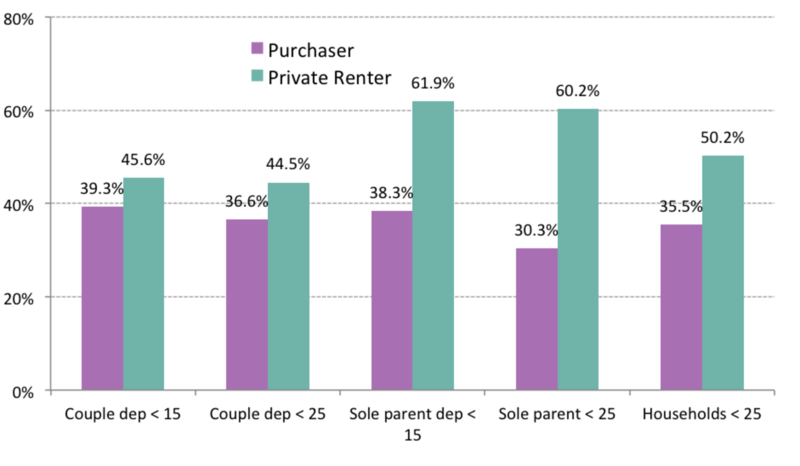 Our analysis of the 2013-14 Australian Bureau of Statistics’ Survey of Income and Housing data confirms that home ownership is out of reach for many families with children and that housing costs – either mortgage or rent – can be crippling. Of lower-income two-parent families with dependent children aged under 15 who are buying their home, 39% face unaffordable mortgage costs. Unaffordable housing costs, known as “housing stress”, refers to households in the lowest 40% of national income distribution, adjusted for household size, paying more than 30% of their disposable income on mortgage or rent. Renting provides little relief. More than 60% of lower-income, single-parent households with children aged under 15 pay unaffordable rent. Close to half of two-parent families are in similar housing stress. The figure below shows that, for some, housing costs account for around 60% of weekly income. This leaves very little for food, clothes and other essential items for children or their parents. Housing costs as a percentage of disposable income among lower-income families. Translating this into numbers of children and young people affected in Australia means that 737,528 children aged 0-14 years and 831,806 aged under 25 were were living in unaffordable housing in 2013-14. Tenure insecurity and housing stress are part of a larger picture of housing disadvantage for many Australian families with dependent children. But we know remarkably little of the social, educational and wellbeing outcomes for these children. The sad irony is that at the same time as the housing market is becoming the source of such struggle for many poorer families, large parts of middle Australia are becoming increasingly wealthy as a result of booming property prices. And state governments are making windfall gains on the stamp duty collected from residential property transactions. Despite widespread concerns about the wellbeing of children and young people, little is yet known in Australia about the role housing, and housing assistance, plays in either exacerbating the risks, mitigating harm, or enhancing children’s immediate and longer-term outcomes and life chances. Recent research has begun to highlight the difficulties families with children face in the Australian housing market. The evidence suggests housing market conditions no longer simply mirror income disadvantage but create an additional form of disadvantage among families on low-to-moderate incomes – and that these conditions are worsening, rather than improving, over time. Clearly, lower-income and single-parent families are at a particular disadvantage. And social housing – which was once a safety net for the most vulnerable families – is no longer adequate to accommodate the range and number of families in need of support. So, does Australia need a ministry for vulnerable children? Whatever the answer, we do need change – and good evidence on which to base that change. Focused policy, including housing policy and policy that integrates service delivery across housing, education, employment, justice and health, as well as a robust evidence base to support it, are essential if we are to improve the life chances of Australian children, and support the work of the children’s commissions we already have in place. By 2030, no Australian child will be living in poverty. But perhaps we could pin our flag to the flagpole, measure it, understand it, and begin to better tackle it.